I was one of the two people standing outside my local AT&T store to get it on release day. 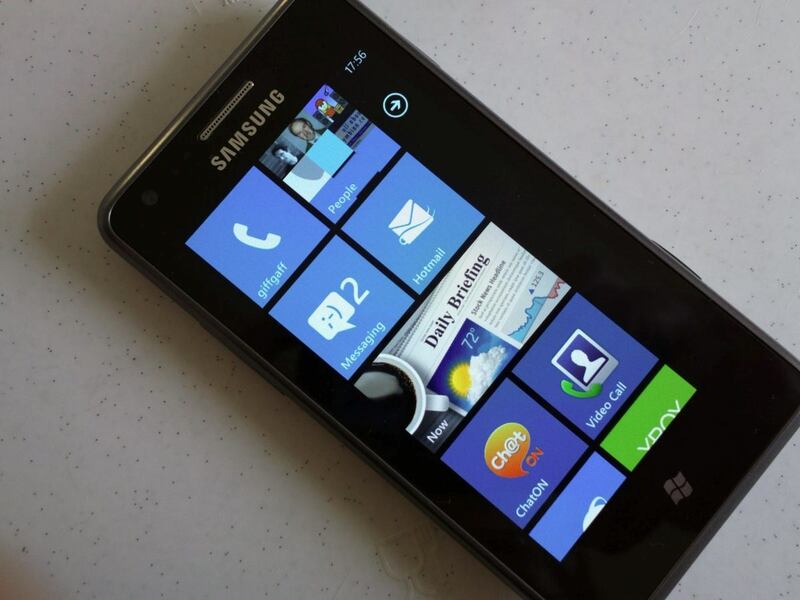 My very first smartphone was a Samsung Windows Mobile 7.0. I skipped all other smart devices, turned in my Motorola flip phone and pocketed one of these.. Here was such a dramatic change on cell phones seen in a LONG time. Live tiles, Xbox integration, deep in the Microsoft environment, and best of all, no stupid wall of icons (ala Windows 3.1). Inspiration for iPhone and Android OS. As the OS matured, it only got better. Tile sizes started ranging from small 1/4th size, to a large 16x grid. Live tiles are absolutely awesome! Weather? 96F. Unread message from my boss in my inbox. My son just got another XBox achievement. Meeting in hour in big conference room. Amazon order just arrived on my porch. My wife has just updated her Facebook profile. Best of all, I only logged into my home screen. "2-click access". With the OS, came some really interesting phones. 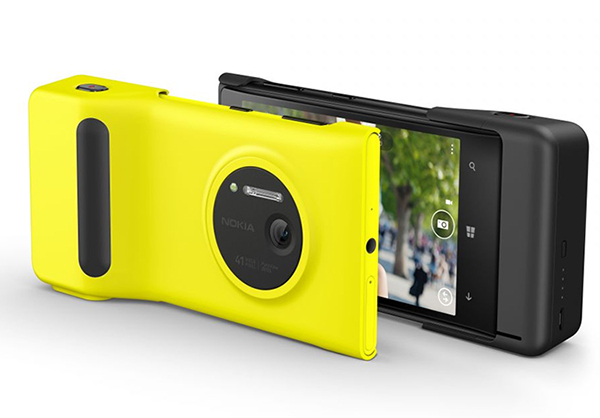 My absolute favorite being the Lumia 1020 with it's glorious 41 megapixel camera. A camera that put my 10-year old DSLR to shame for basic, everyday photography. It's only real drawback was the lack of a microSD card slot, to hold those 20mb images. I loved this camera. I went as far as to purchase the extended battery case. Trips to Disneyland were awesome because I only had to carry my cell to get a big camera; all-in-one, great low-light images, very easy package to carry around. The added battery, plus an real tripod mount on my phone made it possible to take some awesome low-light images. Lumia, the premier windows phone manufacturer was gobbled up, disassembled and soon afterwards, all their production shut down. We've had 3 mediocre (IMO) phones put out. 640, 650, and 950. A few other's, like HP put a toe in the water and spun up the Elite x3, which I was really excited about, but it isn't going to fix things. Things like, apps. Unless you're my uncle, who 'only uses his phone for calls', apps play an important role on any modern handheld. I understand, programmatically the pains of supporting a platform. (i.e. scripts that no longer work due to new technologies, scripts that rely on an API that is barely supported by the vendor.) 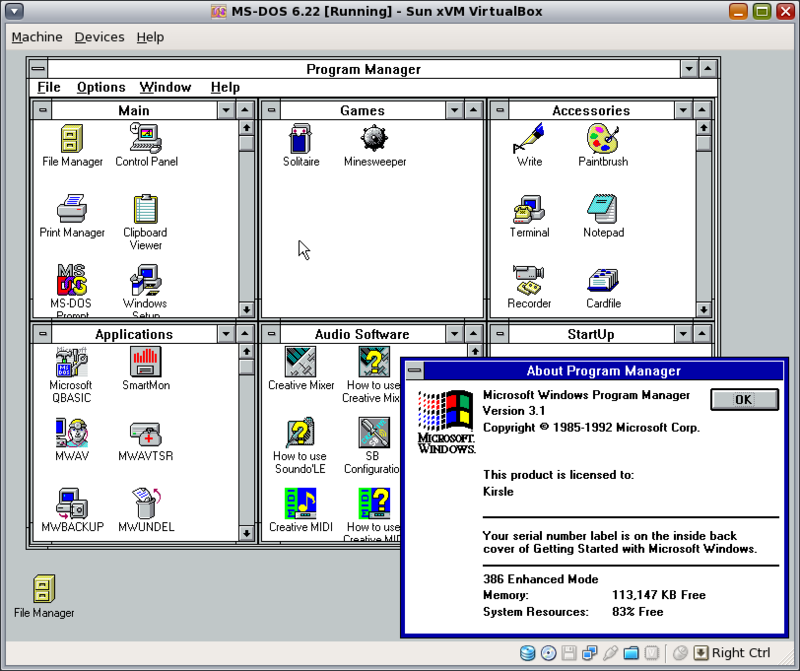 Having not just one, two, but three different operating systems and virtually hundreds of different hardware platforms is more than daunting. A developer's trepidation to simply step into a third handheld arena is palpable. Can you say 'third-wheel'? Android (aka the suit), and Apple (the cheerleader) hanging with Microsoft (the nerd). Why go with 'The Suit'? Two reasons. I am already one foot into the google landscape. This blog is hosted blogger.com, which is ran by Google. Second, while Apple does have some nice looking hardware, she is very high maintenance. All about the bling. Android is at least grounded in a bit of reality, having reasonably priced hardware. In addition, the OS is 'fairly open'. It's not impossible to customize the loader, or change the search engine to meet my eccentric whims. I started off with a work paid-for Galaxy S5. I had this for about a week for testing the deployment of new MDM solution in-house. During the week that I had this, I enjoyed being able to play Pokemon Go, stream music via the Amazon Prime app, watch tv via the Xfinity TV app, and even run Disney Appisodes for my toddler. Apps, apps and more apps. Kid in a candy store and all for free!! Meanwhile on my Windows Mobile: Amazon pulls their app and replaces it with pitiful web skin. Battery on my Lumia 1520 is topping out at 2 hours on fast ring build in stand-by. Pokemon Go had my 10 year old wanting to walk the half mile to the neighborhood park. 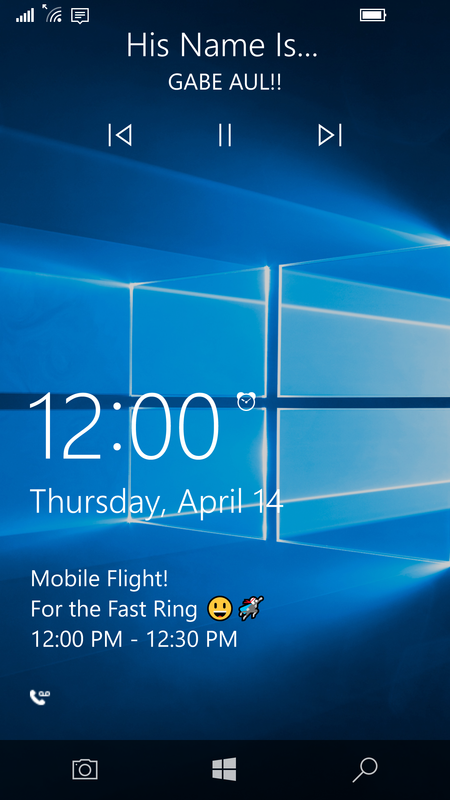 Even better, with a little finagling, I was able to 'win-mobile'-ify my phone. I tried looking for a decent 'live tiles' loader, but none had the real flair of Windows mobile 10, maybe WP7 where there are only 2 button sizes. Bleh. Nova Launcher provided both a sorted app list, and app grouping (which is 70% of what I missed). Home screen now has three groups, 'entertainment', 'games' and 'work' plus shortcut to my wife's contact. Next step, Cortana. Holding down the home key brings up the Cortana (beta) and I get my familiar search functionality (plus my fka Bing rewards for searches). In addition, I get alerts on my Win10PC about new SMS messages, battery low, etc.. The lousy part is I've broken voice searching, 'OK Google' nothing and 'Hey Cortana' only works from inside the app. After the testing, I returned the phone and then seriously started considering Android as an option. A co-worker presented me with his 'old' work phone. He has a Samsung Galaxy S6 that he wasn't using at the moment and I could long-term borrow it. OK! Pulling the sim from my Lumia, I started rebuilding this phone. Only this time, adding widgets for weather, (Outlook) calendar and Audible. Full media control from lock screen - WP has this awesome option that if I tap the physical volume buttons, the system's media interface drops down, then I can pause currently playing media (audible, spotify, etc.). Android appears to not like that and it requires a widget on the screen to give you basic lock-screen functionality. The land of micro-transaction - Do you want weather with no ads? $2/month. Want spam call blocking? $1/month Want a new theme for your phone (no bing image of day)? $1.50. While I was used to some of this on Windows Phone, the Android market place is more wild-west. You can find a hundred free apps, each with a multitude levels of microtransaction built into it. Loss of live tiles - Widget have helped with this but it's simply not as elegant. Clicking on an appointment on my work calendar doesn't play well with the corporate MDM policies. I often get a 'your corporate policy doesn't allow this' notification because of 'crossing boundaries'. When it was the Outlook live tile providing the meeting info, it didn't complain. Bluetooth support - I was living the wireless dream. Sit down in my car, put it on the charger base, start streaming audio. Phone played music/audio via bluetooth connection to my car stereo. Unfortunately, this S6 does not work at all. The bluetooth at best will play 10 seconds of audio, then reset the connection. This will either restart the audio, rewind 5 seconds or stop playback altogether. I'm forced into using a wired 'auxiliary' cable to connect my phone to my stereo. Bloatware and nagging native apps - it was annoying on Windows that the native apps would reinstall after a full rebuild, but I COULD uninstall all of them if I wanted to. That ISP based navigation system that requires a special subscription? Gone. Family tracking app when only my wife has a phone? Gone. Android on the other hand forces me to keep all of these apps and more. In fact, it makes it REALLY hard to not use them, I continue to get notifications that the native email client needs my credentials for my work email. Guess what, my employer won't let the native app sync, we're an O365 shop, so it will NEVER work. Stop asking me and go away..
Amazon sees my giant water glass. 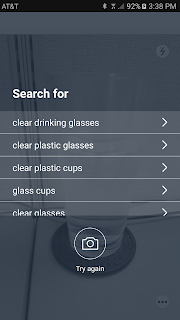 Richer apps - Not only is the Android Amazon app not a web-skin, but it has awesome object scanning functionality. Point the scanner at the a barcode and it quickly find the item. Point the scanner at the water glass on my desk, it returns keywords related to that item. Richer accessory ecosystem - Search Amazon for a Galaxy S6 (or work sponsored S5) case and it returns 1.6 million options. Search for my Lumia 1520, you don't get even 1% of the options. Microsoft apps still work - Cortana is here for my searches. OneDrive is still backing up my photos. Word, Excel, Outlook are available for my work. Microsoft, do you want me back? Become more Disney. While, I've quit using my Windows Phone, I still prefer the OS. Win mobile has character. Because it's a brand new OS, you've customized beyond the other two options, adding little tidbits/flavor items. I kind of think of you as a renaissance faire. Tons of character, limitless customization options and your biggest draw is homegrown apps by third party 'entertainers'. On the other hand, Android is like Disneyland. There is no originality, no individuality, no character, but they have a TON of flash, bang and glitz. Fireworks, movie-themed amusement rides and churros draw in a lot more people than jousting tournaments and turkey legs. I want Disneyland on my terms. I want a phone to brag about with more flavor of Windows Mobile. I need you to be enthusiastic about selling the phone. That will make people more enthusiastic to buy it and people enthusiastic to develop for it. You and only you are going to break down that app wall. I like that the Amazon app can scan something without a barcode and return results close to it. Surface phone better come true. It better be awesome, ground breaking and absolutely shiny with all those bells and whistles that that "Surface" name implies. Phone case with BT keyboard? Wireless charging? Bring back the Android bridge. This will help because we get access to the apps, and developers don't have to design for 3 different OS. You have to realize that if you're target audience is only corporate, you are becoming RIM and what's their latest phone? None. They plan to give up their 0.01% handheld marketshare to focus on MDM solutions. At least Microsoft, you have Office/o365 and Windows on desktop, I suppose there's always that.